Ah, it's just about harvest season here in the northeast. Temperatures drop, colorful leaves paint the countryside with red and yellow accents, corn mazes and haunted houses open up—and last but not least, store shelves abound with pumpkin and apple-flavored treats. And this is our first fall-themed product of the season as far as Target goes. So far, so good. Just in the past twelve months, I've seen cranberry caramel corn, mango coconut caramel corn, and recently, pumpkin spice caramel corn. Not all from Archer Farms, of course, but still, it's an interesting trend—and one that I can appreciate. I was never into caramel corn before, but now, it's fun to try all these different versions of it, infused with various fruits and flavors. 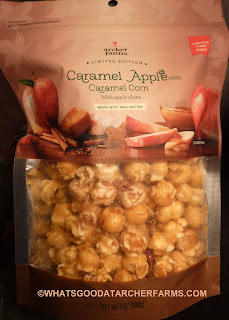 And this new caramel apple flavor is absolutely on par with all the other fascinating varieties of caramel corn I've tried. We already know that apple and caramel go hand in hand, in the manner of a traditional caramel apple. It's also a no-brainer that caramel and popcorn can work together. So by the transitive property of deliciousness, all three ingredients must necessarily blend well together, too. The apple flavor is definitely there, but not overpowering. If anything, I'd want more apple taste in this product. A few bites contained surprisingly large slices of actual dried apple. Those particular bites were adequately applicious, but in general, I could always go for more. 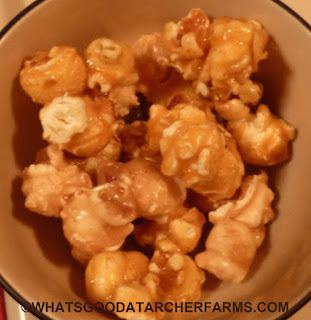 The product is sticky and sugary, similar to traditional caramel corn. Likewise, the dried apple pieces are pretty much what you'd expect—and again, some dried apple pieces are huge, while most of the others are small. In general, that's my biggest complaint. More of the larger apple slices could really improve this product. As it is, it's still worth a purchase, particularly if you love the taste of caramel apples. Thumbs up from me. I give this snack 8 out of 10 stars.